If you’re thinking of withdrawing money from your locked-in RRSP or pension funds to help you during a financial hardship, it would be best to speak with a Credit Counsellor first. Other options may be available to you so that you won’t need to use these funds. If, however, you’d like to look into the reasons that allow you unlock and withdraw money from your Locked-in Retirement Account (LIRA), Life Income Fund (LIF), or Locked-in Retirement Income Fund (LRIF), we’ve got all the financial hardship reasons listed below. Before we get to that, though, we should mention one important detail. To unlock pension funds, they must first be transferred out of an employer’s Registered Pension Plan (RPP) and into a LIRA or LIF in your name, and you typically must also be no longer employed by the company who created the pension. Below are reasons that permit you to unlock locked-in pension funds. Every locked in pension is locked and preserved for your retirement under the legislation of either a specific province or under federal legislation. You’ll have to check your pension documentation to see which provincial legislation it is locked in under (the financial institution that holds the funds will also have this documentation if you can’t find yours). Beside each reason below are the provinces (or federal legislation) that permit you to withdraw funds for that reason. High Medical or Disability Related Costs - You need money for medical expenses that are not covered by a medical plan or any other source, or you need to pay for renovations to your home that are required due to illness or disability. 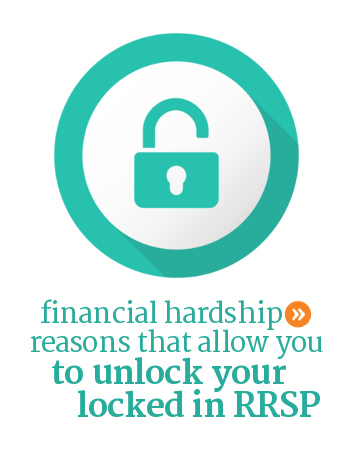 Provincial Financial Hardship Unlocking (FHU) programs are intended to provide a one-time source of financial relief to locked-in account owners who are experiencing financial hardship. The financial institution holding the locked-in retirement funds must review your situation to ensure it meets the requirements of the provincial legislation that govern their locked-in funds. The government is not involved in the decision to unlock your funds. All they have done is create the legislation for your province, and then it’s up to your financial institution to follow the legislation. You don’t have to provide information about your other assets to qualify. All you need to fill out are the specific documents that apply to the reason why you are applying to withdraw your locked-in funds. There is often no charge for applying. However, provincial legislation does not prevent your financial institution from charging you a fee. For all situations involving financial hardship – especially withdrawing locked-in funds – the ideal person to talk to first is a non-profit Credit Counsellor. They often find that many people make a difficult situation worse for themselves by taking actions that seem right at the time, but in the end only end up leaving them in a worse financial position. Experienced, well trained Credit Counsellors are true financial hardship experts. They can guide you through all your options and help you figure out what steps would be in your best interest and which would not. The nice thing is that an appointment with a non-profit Credit Counsellor is usually free, and they’re able to provide you with an objective perspective and very helpful information. To find a good non-profit credit counselling organization near you, click here. I am presently recovering from a life threatening situation, requiring surgical intervetion and lengthy recovery process. I'm required to see my physican and nursing staff for wound care regularly still. Currently, I am unable to work and have no other sources of income. I am on medical disability and my wife got some funding and receiving a small amount of money each week paid through the EI for going to college, she is 55 and has a small lira account which we could use because of financial hardship. Would she still be eligible for the EI weekly benefit if she unlocked the lira due to financial hardship. That's a really good question and one you are wise to investigate before technically increasing your income by redeeming the LIRA. If you have a contact person at EI, this would be a good question to ask them. You can also go to the Employment Insurance website, see if you can find information on this or contact them and see what help they can provide. What if the hardship hasn't passed & I need to go in the fund a second time? Better yet, what if amount left is low & I would prefer to just withdraw the entire amount? Can I unlock my pension for second time in one year I am really having financial problems. Am behind on two months rent, I also co-signed for my daughter to rent a place. She have financial hardship and know they are asking me to pay it. If your pension is a locked-in RRSP and it's within the small balance amount that permits you to withdraw funds, you should be able to make as many withdrawals as you want until the money is gone. Our best suggestion though, would be to call 1-888-527-8999 and make an appointment to speak with a non-profit Credit Counsellor. It's possible that they may be able to help you find other options other than using your pension money. Hi, you'll need to find out which financial institution is holding your LIRA. Then you'll need to contact them and see which legislation governs your locked in funds (either provincial or federal). Once you know which provincial legislation (or federal) your funds are locked in under, you can see if your situation would qualify for an early redemption. You may need to look into this yourself rather than relying on the financial institution to advise you since this isn't the sort of thing that most financial professionals deal with on a regular basis. Hi Scott, To help you figure something out, we would offer two suggestions: 1) You could contact the company that holds your pension and see if there is any possible way they can release some of the money (if there is a way, someone with a lot of experience who works there might know), and 2) try sitting down with a local non-profit Credit Counsellor. Go over you situation with them, and see if they are able to come up with any solutions that might work for you. You can find one here: https://www.mymoneycoach.ca/budgeting/loans-debt-credit/get-debt-help . There is also a link near the top of this article. My mom is currently sick and has been in and out of the hospital in the Philippines. We have incurred medical bills... and would want to withdraw some $ on my LIRA. I checked the forms but it is asking for a licensed medical practitioner to sign the forms... but how can I ask a doctor here to certify for my mom’s condition? I am currently securing a phycician’s certificate for my family Care Leave application for EI as she is already critical condition—to be signed by mom’s doctor in the Philippines. Would that suffice as supporting documents together with the receipts of bills? You'll need to contact the financial institution that holds your LIRA and ask them these questions. If you can satisfy them that you have met the appropriate requirements, then they can release your funds to you. Ontario Teacher's Pension Fund Question. I received a lump sum settlement from my LTD insurance carrier in 2012. My earliest retirement date is May 2019 as outlined in settlement. I find myself in financial crisis with experiencing less interest on lump sum than anticipated along with increased medical bills - this lump sum will not sustain me until May 2019. Are there any loop holes regarding my teacher's pension where I can access a one time sum under these circumstances to help me reach my retirement date without becoming homeless??? Thank you. Hi Lorraine, We're sorry to hear about your situation. In your case, we would encourage you to contact a knowledgeable person within the Ontario Teacher's Pension Fund and ask them if there is a way you can get early access to your funds because of your hardship. We're not familiar with your pension's rules, but hopefully they'd have some sort of hardship provision you could possible tap into. If you can find a knowledgeable, compassionate person to speak with, hopefully they can either help you out or direct you to something else that could help tide you over until May 2019. If you have a financial planner or accountant, it's possible that they may have more information on this too, but start with someone at the pension plan, they're likely to know the most. I’ve already taken out $ for hardship. I needed to buy a car. I have orthostatic hypotension and have fallen on bus and while walking. I need the car for health reasons. Now what do I do to get some extra to last me till Dec. OAS doesn’t start till Nov 30th. I don’t know how long I can go on. Hi Anne, We're sorry to hear about your situation. We would strongly suggest that you contact the Credit Counselling Society at 1-888-527-8999 and make an appointment to speak with one of their Credit Counsellors. They can help you take a look at your whole situation and hopefully help you put together a plan to deal with these challenges. They may have suggestions in regard to options you may not have considered or other places you may be able to find some help. I am in Canada on a working permit. I am leaving Canada soon and I would like to move my funds when I move, mostly out of convenience but partially I am worried about losing access altogether after I leave. i cannot find any information on this clause and would like to know more to see if i am able to enact this clause. Hi, the best thing to do would be to talk with the financial institution that holds your locked in funds. If your balance is within the small balance unlocking amount for the legislation that governs your locked in funds, you should be able to take the money out without any problem. If your balance is over the small balance unlocking amount, then you may have to leave the funds there until you qualify to withdraw the funds. If you leave the country, you should be able to provide your financial institution with your contact information and keep your account active. Tell them about your situation and ask them what they would suggest you do. My wife and I are both with Manulife. We contribute through our work. She has a DPSP (deferred Profit sharing plan) while I have a RPP (Registered Pension Plan). Both of us have been told by them that unless we quit or retire we are not able to access that money since we still work for the company where we contribute. We are in a bind with our mortgage right now and I need to catch up on my arrears in the next couple of months before I can renew, so we are in a tight spot. How can I go about through some sort of loophole to get some of that money out? Hi Phil, It’s difficult replying to a question like this without more information, but here are some suggestions to help you find some personalized help. 1) See what can be done about the mortgage first. Touching your retirement funds should be your very, very last option. If your mortgage is insured through CMHC or Genworth, they have programs designed to help people who are struggling with their mortgage. These programs can include many options. Contact one of these companies if your mortgage is insured through them and then follow their process. Alternatively, contact your bank and speak with someone there who has many years of experience. See if there is any way the bank can work with you to work something out. 2) Speak with a non-profit credit counsellor to see if they can offer any insights or help. Depending on your situation, they may be able to suggest some things you may not have considered or were aware of. They would also look to see if any kind of debt relief program could help you. 3) If all of these suggestions don’t help you find a workable solution, then try and speak with a very experienced, sympathetic person at your pension company to see if there isn’t some way you can work something out. If your pension is governed by the laws of Ontario, Alberta, or Nova Scotia, then potential foreclosure is a hardship reason that can potentially be used to unlock funds. Try focusing on the first two groups of suggestions above and only come back to number three if nothing else works. If once you start a minimum annual withdrawal for hardship reasons, are you able to discontinue those withdrawals after the need is over?? Person’s age is 63. When you make a withdrawal for hardship reasons, it is a lump sum withdrawal. There is no payment schedule. You can take as much or as little of the RRSP funds as you wish within the maximum amount you are allowed to withdraw for the reason you qualified for. Remember, though, the more you take out, the more tax you will have to pay, and the less money you will have left for your retirement years. I live in BC. I have a dcpp at around $9,000 with sunlife. I’ve been waiting for my options but I’d like to take the lump sum. I’m wondering if it has to be 20% or less of the ympe for the year of just the actual balance or if it’s the commuted value that’s taken into consideration? Hi Erica, Sorry we can't help much with this question. You'll need to find out from SunLife what the restrictions are on your plan. What often happens with a DCPP is that when someone leaves the employer that set it up, they can choose to transfer it into a locked-in plan. If that is done, then the opportunity to unlock the funds for the hardship reasons listed above could apply. Normally with locked-in funds, a 20% of YMPE withdrawal rule would apply to the actual, current balance of the plan. If you want to withdraw funds under the small amount rule, the plan balance would normally need to be equal to or less than 20% of YMPE. I have 2 questions: can one transfer amounts from the new LIF into an RRSP?? If yes, how much and can it be ‘in kind’?? Secondly, if one starts minimum withdrawals from the new LIF, can they be suspended?? The person is 63 years old. Hi Peter, You'll need to ask your financial institution that holds your LIF these questions. It will depend on your financial institution and how things are setup. Hopefully they can give you an idea of how much time their process will take. However, in a best case scenario where your locked in RRSP is held at the same bank branch as your bank account, your reason for unlocking is easily verified (Small Balance Unlocking would be a good example), and you are dealing with someone at your branch who is familiar with unlocking funds, then you would receive your money immediately in the same way you would if you redeemed some normal RRSP funds. If more verification is required, people involved aren't familiar with unlocking locked in funds, or someone else's approval is required, then each of these factors could of course add more time to the process.